Bailey Fights Blight is a collaborative project being spearheaded by the Bailey Avenue Business Association that seeks to board up and secure blighted and vacant storefronts along Bailey Avenue, while incorporating public art as a way to beautify the neighborhood, re-imagine these properties, and help redevelop the commercial corridor’s identity and sense of place. The project has already brought over 200 volunteers from the community, area schools and universities, and businesses to board vacant and blighted buildings and prime the boards for art along Bailey Avenue. More public art will soon be headed to Bailey Avenue thanks to a $2,000 grant from the Arts Service Initiative of Western New York awarded to the University District Community Development Association (UDCDA). The new program will use these boarded up storefronts as canvases for public art inspired by the businesses along Bailey as well as the history and culture of the street. Thanks to this grant, the UDCDA will be able to work collaboratively with Nick Miller, a mural artist who recently moved to Buffalo. He brings his experience working closely with Philadelphia’s mural arts program, one of the largest in the country. With nearly 20,000 cars traveling down Bailey every day, turning vacant and blighted buildings into pieces of art and visual statements on the neighborhood not only transforms Bailey’s physical fabric, but also can begin to change people’s perceptions and attitudes toward the street. Join us for a community brainstorming session on Saturday, June 4, 2016! Saturday, June 4th, Noon – 3PM: Bring ideas for what kind of public art you’d like to see on Bailey Avenue. There will be plenty of ways for your to get creative! Saturday, July 9th, Noon – 3PM: We’ll start refining ideas from the previous brainstorming session and work to finalize designs for the Bailey Avenue murals. Saturday, July 16th, 10AM – 2PM: Join professional artists, business owners, and community members as we start to paint the designs created through community brainstorming. We’ll also host a neighborhood cleanup for those less artistically inclined! Saturday, July 23rd, 10AM – 2PM: We’ll continue to work on the murals along Bailey Avenue and host another cleanup. Saturday, July 30th, 10AM – 2PM: We’ll work to finish the murals on Bailey Avenue and host another cleanup. 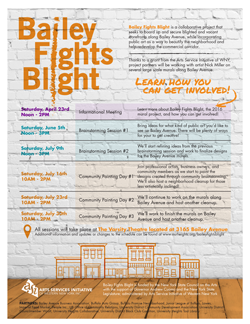 Help us fight blight on Bailey Avenue by getting the word out! Do you know someone interested in taking a hands on approach to community development? We’re looking for individuals to help us board and secure blighted buildings along Bailey as well as lending their artist talents to help transform these buildings using public art. Help us get the word out by sharing our flyer with your friends, family, and neighbors! Bailey Fights Blight is funded by the New York State Council on the Arts with the support of Governor Andrew Cuomo and the New York State Legislature; administered by Arts Service Initiative of Western New York.